Make tassels on the corners of their garments throughout their generations, and to put a cord of blue (techelet) on the tassel of each corner. Last week I posted a blog on a new discovery in the field of techelet research. A piece of fabric that was discovered in the 1950s near the Dead Sea was recently tested and found to be dyed with secretions from the Murex trunculus. There is an ongoing debate as to what the source of the techelet blue in the Bible really was. This new discovery has caused some to say that this adds significant credibility to the argument that the techelet blue dye of the Bible was from the Murex trunculus. You can read all about it here. The counterfeits were becoming more and more popular for two reasons. First, the Jewish people simply could not afford even a small amount of the authentic techelet. As Milgrom pointed out, the two unsuccessful revolts against Rome had left the Jewish communities in a dire state of poverty. Second, the price of this dye went up and up as production declined. Eventually, the precise identification of the chillazon—the source of the dye—was forgotten as well. 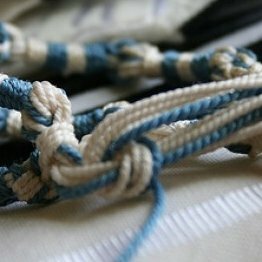 Some might feel that this means that the rabbis’ ruling overrode the commandment to have a thread of blue in the tzitzit and is therefore abolishing the Torah. Rather, the sages upheld the Torah by prohibiting the use of counterfeit techelet. They knew that people would be inclined to use substitutions, but substitutions do not fulfill the commandment and they cheapen the meaning of true techelet. Other people might attempt to purchase the true techelet at extreme expense and hardship, or worse yet, be tempted to purchase the imitation techelet, thus violating the Torah. Therefore, they ruled to protect both the authenticity of the commandment and human dignity; they felt it was better to do half of the mitzvah correctly rather than to do all of it incorrectly. The rabbis ruled to protect the commandant from being violated and those rulings are still upheld today. It's true that wearing techeles is a mitzvah. But Jews have not worn techeles for many centuries. Reintroducing techeles is a significant change - and it comes from people who are (a) academics rather than rabbis, and (b) not from the chareidi world. For many Orthodox Jews, and especially for chareidi Jews, techeles is therefore an innovation that comes from outside sources. In case there is any confusion, I am certainly not saying that nobody should wear techeles. All I am saying is that the chareidi opposition to wearing techeles is very understandable, in light of their worldview regarding Judaism. You can read his full blog here. While we might not agree with all of his and others reasons for not wearing techelet, it is a complicated issue. But, God willing, these new discoveries will keep pressing the issue and perhaps in the near future a consensus will be reached about the true source of techelet. For more on techelet and tzitzit in general see First Fruits of Zion’s book Tzitzit: You Shall Make for Yourselves Tassels on the Four Corners of the Garment.